“—Good Saint, I am not acquainted with you and dare not speak with you too much, because you seem to me endowed with too sublime a highness. “ ‘You never saw me, but perhaps you know my name? I am Saint Gregory, Pope and Doctor of the Church. I come to give you a word on the part of the Lord …' "
[Source: pp.221-2, Prophecies of La Fraudais, August 19, 1878]. 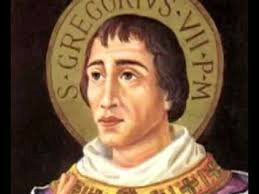 Pope St. Gregory the Great, known as Pope Gregory VII, was Pope Gregory XVII’s favourite pope. This is why when Cardinal Giuseppe Siri was elected Pope on October 26, 1958, he chose the name Gregory as his Papal Name. Pope St. Gregory VII gives us the encouragement to love God, and this is no small thing. He tells us that in return for God’s great love, most men, during their earthly lifetimes, give God only “insults and profanations”. This conversation between Marie-Julie Jahenny and Pope St. Gregory the Great, comes in 1878, just thirty-two years after Our Holy Mother’s similar exhortations during her apparition at La Salette. Can we not say the same thing of our current times? Is not most of humanity absolutely ignorant of God? This is the Spiritual Chastisement over which Our Holy Mother of La Salette wept bitterly. Pope St. Gregory says, “O blind man of present time, when is light going to impress your eye to let you see all God is accomplishing through His infinite power, in every place and everywhere?” And our Faith tells us that this is true, that God is accomplishing many things through His infinite power, in every place and everywhere, but that we can only see this through the eyes of Faith! This is why our prayers are so important for the many, many souls of all ages, who cannot see God’s works in their lives. Think of it: a child who does not know God cannot know real joy. Now think of the millions upon millions of such children and we begin to see the darkness in their lives, in their homes, and in our towns and cities. This darkness is everywhere! There is no real joy for these souls who surround us because they do not know God. And as for the state of the souls who were given knowledge of the True Church, but have rejected Her to have their false sacraments and their supposed freedom from Papal Authority, which is actually God’s Authority over them? Pope St. Gregory speaks to us of them: “Let us be trembling, we the small number of God’s friends, over the fate of so many unfortunate souls who rejected light in order to live in idolatry.” These souls are culpable before God, unless they turn to the One True Shepherd of the One True Church, outside of which there is NO SALVATION! Where is the True Church? When Pope Gregory XVII was pushed aside, Holy Mother Church was “threatened and beaten down”. This is why She is in Exile. And Her “hour of the promised triumph” will be the destruction of that false church with its false maxims coming from today’s Vatican City. This is why Pope St. Gregory asks: “[W]hat will those souls be thinking? They will have nothing left.” They, who thought themselves in the Catholic Church will see the antipopes ended, and then their false church will look like a big lie. This seeming triumph of God’s enemies (and most assuredly, they will be glad) is, in fact, the triumph of God’s Truth. Yes, God will bring about this destruction: “God will have given His command; God will have brought scandal to an end.” Now Holy Mother Church and Her Pope can be restored so that souls may be fed with true bread for their starved souls. Her “promised triumph” will take place, but souls will be confused and possibly brought to a state of soul-killing despair. May the love of God enkindle us to pray for these millions upon millions of souls: children, youth, and adults, that they be given the Grace to know the True Church coming out of Her Exile, so that their shock and sadness may be turned to real, everlasting joy. May these souls know the Joy of God at last! Deo gratias!